Long, long ago, when I was younger I first experienced the wonder that is a compact disc. It was new. It was wierd. It was fragle and shiny. It went into a giant bulky machine and played music. Way back then, I thought to myself, "One day this compact disc played will be no bigger than this plastic jewel case." That day has finally arrived. 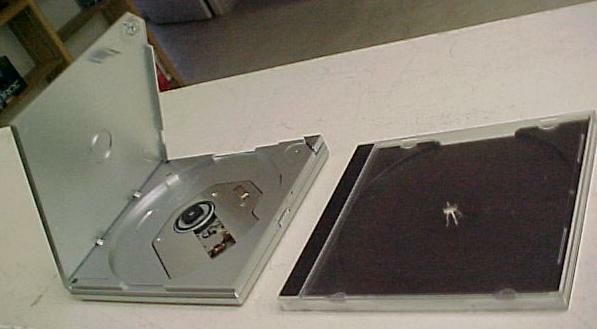 A laptop came in the shop with an external DVD drive that closely resembeled a jewel case. I was impressed, and then I realized that long ago I was right.